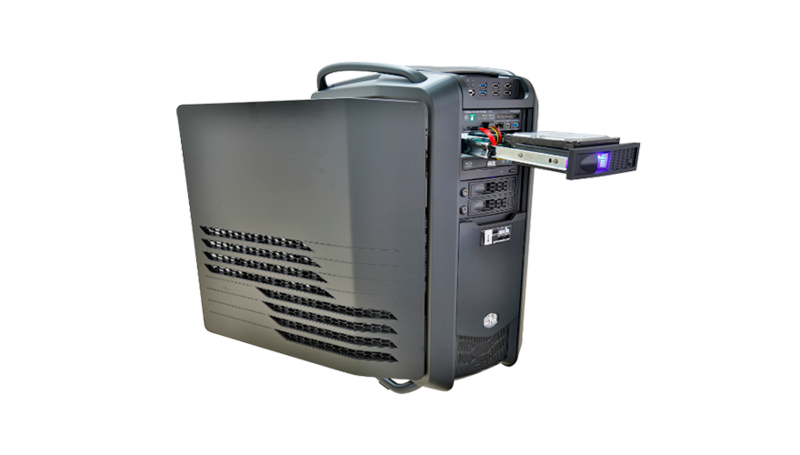 The AntAnalyzer is the right choice for indexing and processing IT-forensic cases at the work desk. The series is known and favored for its speed, reliability and persistence around the world. Additional to our four default configurations we provide detailed modifications to measure up all your personal needs. Big Tower Case: 344 x 704 x 664 mm • Front Panel: 2 x USB 3.0, 4 x USB 2.0, 1 x e-SATA, Fan LED on/off • Power supply: Modular (850 W) • Mainboard: X299 Chip set, Gigabit LAN, 2x USB 3.1 Type-C & Type-A) • Pro- cessor: 6-Core, i7-7800X 3.5GHz (8.25M Cache, up to 4.00 GHz) • RAM: 32 GB DDR4 (up to 128 GB) • Video Card: NVIDIA GeForce GTX/RTX, 3GB GDDR5, DVI, HDMI, DP • System: 250 GB M.2 PCIe SSD • Cache: 500 GB SSD • Data: 2 x 4 TB Enterprise HDD • Backplane: 2x 3,5” screw less, hot-swap • Optical Drive: DVD RW. Estas son las especificaciones estándar del Antanalyzer. Todos los elementos son configurables.